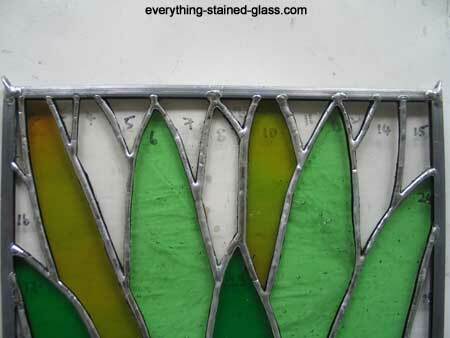 These stained glass instructions show you how to make and solder hooks on to a zinc frame. It uses a simple, nearly invisible method of adding hooks to stained glass to allow hanging that shows off your beautiful stained glass in the best possible light. The rings in this stained glass tutorial are made from recycled copper wire stripped from electrical wiring. Alternatively – and this is my favourite option – you can use spools of pre-tinned copper wire (try gauge 14 or 16 if you have a smaller item to hang) which is easier than stripping and tinning your own, cheaper than buying ready-made rings AND more flexible with regards to size!) or you can buy ready made pre-tinned rings (the easiest but most expensive option). These discreet hooks are going to follow the 45 degree angle at the corner of your panel instead of the more usual circular hoops. Use of round nosed pliers (small ones available at craft shops and larger ones, size of the typical needle nose pliers, available at some tool stores) can ensure crinkle-free and nick-free bends in homemade hanging loops. This both strengthens the wire and stops the copper from corroding. You don’t need to do this if you’ve bought pre-tinned rings or wire. One of my online students Georgia Hamilton has very kindly sent me these images showing how she cleverly makes a handy hanger tuck nice and securely into the corner of the zinc frame. This may not be as pleasing to the eye as some other types of hangers but it creates a really secure fixing. For added security you can clean the inside of the zinc where the hanger is going to go, put some solder inside the zinc and then reflow it when you insert the hanger. This gives you peace of mind knowing that it is soldered inside the channel. Now you’re ready for the final step – making your panel gleam and shine. Go to the patina and polishing instruction to finish off your panel. Can we get these in the UK? I haven’t found anywhere that sells them. I have tried Pearsons Glass (liverpool), Tempsford stained glass supplies and Creative glass guild. You could try adapting non-insulated ring terminals online. You’d have to squash the end and use them for zinc came so that the squashed end can be soldered into and hidden by the gap in the centre of the channel. Thanks to Abby Mitchell who emailed me this idea and this link for US visitors: These would work, too, I think. You get 100 for $10. Just crimp the bottom so it fits in between the framing. They’re made from tin plated copper that can be crimped or soldered. 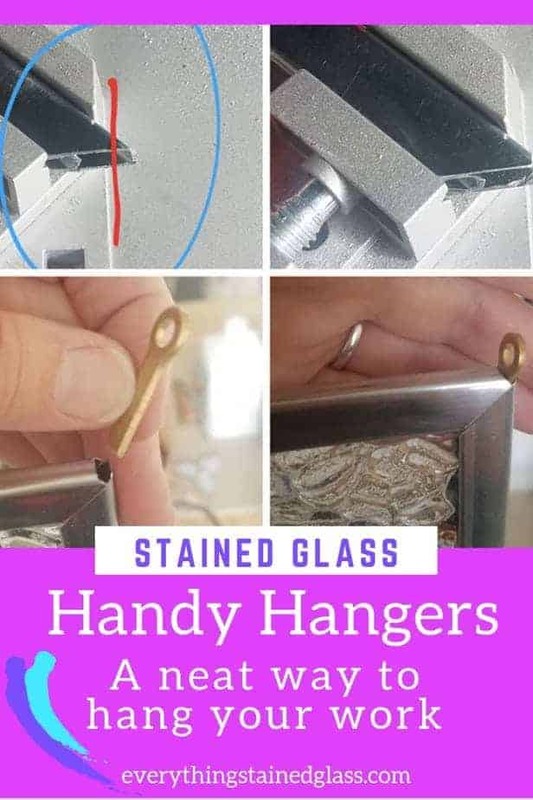 Theses tips are perfect for zinc or lead frames but what I would like to know is if there’s a company anywhere that sells round wood frames to display copper foil stained glass? ….or infact any nice wooden displays for glass, standing or hanging? There’s a link to an online wood frame maker on this page, under the heading ‘Framing and Hanging’. Good question Kizzy, thanks. Great idea if you are using zinc came, but How do you attach hooks using lead came especially like me you don’t have a controlled temp. soldering iron. Any ideas would be gratefully appreciated. The handy hangers are good for zinc as they slot in the gap. The instructions above using tinned copper wire on the corners are perfect for lead came too Marg. Thanks for your question. I fold a piece of pre-tinned wire over a screw driver and then grab both ends with pliers and twist it into an eyelet. Snip off the ends so it is neat and then insert the end into a hole in the zinc at the corner seam. Melt some solder into the hole and you have a secure and neat hanger. Easier to handle than a U of wire, and neater at the corner. I used to make ‘U’s, and I found them hard to keep straight when soldering trying to hold them with pliers. So now, I take a 1.5″ piece of wire and flatten both ends. I solder one side on (the flattened end lays lower in the seam). When cooled, I flip the panel, bend the wire over a pencil (or exacto knife) to make the ‘U’, I use my pliers to put a slight bend in it so the other side will sit flush. Then I solder the other side. The flattened edges, I find, blend in nicely in the seam. That’s a really good tip Pamela, thanks for sharing it with everyone. Very useful. I always make my hooks or rings by wrapping the copper around the end of one of my brushes. This gives me a really even circular appearance without messy links in the wire. My brushes are tapered so I can make them in almost any size I want. Thanks Amanda, that’s kind of you to share your ideas – I like the tapering brush=different size rings. If anyone would like a tutorial of making jump rings there’s one here. It’s nice to see someone share there expertise and not wanting to sell something all the time. Keep up the good work of sharing your craftsmanship. I’m glad you’re enjoying all the free tutorials Kenneth. I do have a course for sale coming up though, so watch out for that!